An O-ring, also known as a packing, or a toric joint, is a mechanical gasket in the shape of a torus; it is a loop of elastomer with a disc-shaped cross-section, designed to be seated in a groove and compressed during assembly between two or more parts, creating a seal at the interface. The O-ring may be used in static or dynamic applications where there is relative motion between the parts and the O-ring; rotating pump shafts and hydraulic cylinder pistons, for example. O-rings are one of the most common seals used in machine design because they are inexpensive and easy to make, reliable, and have simple mounting requirements. They can seal tens of megapascals (thousands of psi) pressure. The US patent claim for the O-ring was filed in 1937 by a then 72-year-old Danish -born machinist, Niels Christensen. He came to USA in 1891 and soon after that patented an air brake system for streetcars (trams). Despite his legal efforts, his intellectual property rights were passed from company to company until they ended up at Westinghouse. During World War II, the US government commandeered the O-ring patent as a critical war-related item and gave the right to manufacture to other organizations. Christensen got a lump sum payment of US$75,000 for his efforts. Litigation resulted in a $100,000 payment to his heirs in 1971, 19 years after his death. Pressure distribution within the cross-section of the O-ring. The red lines are hard surfaces, which apply high pressure. The fluid in the seams has lower pressure. The soft O-ring bridges the pressure over the seams. O-rings are one of the simplest, yet most engineered, precise, and useful seal designs ever developed. They are one of the most common and important elements of machine design. O-rings are available in various metric and inch standard sizes. Sizes are specified by the inside diameter and the cross section diameter (thickness). In the US the most common standard inch sizes are per SAE AS568B specification (i.e. AS568-214). ISO 3601-1:2008 contains the most commonly used standard sizes, both inch and metric, worldwide. The UK also has standards sizes known as BS sizes and typically range from BS001 to BS932. Several other size specifications also exist. Successful O-ring joint design requires a rigid mechanical mounting that applies a predictable deformation to the O-ring. This introduces a calculated mechanical stress at the O-ring contacting surfaces. As long as the pressure of the fluid being contained does not exceed the contact stress of the O-ring, leaking cannot occur. 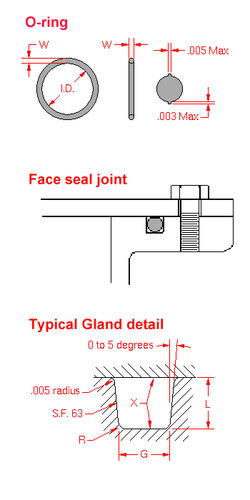 The seal is designed to have a point contact between the O-ring and sealing faces. This allows a high local stress, able to contain high pressure, without exceeding the yield stress of the O-ring body. The flexible nature of O-ring materials accommodates imperfections in the mounting parts. But it is still important to maintain good surface finish of those mating parts, especially at low temperatures where the seal rubber reaches its glass transition temperature and becomes increasingly crystalline. In vacuum applications, the permeability of the material makes point contacts quite useless. Instead, higher mounting forces are used and the ring fills the whole groove. Also, round back-up rings are used to save the ring from excessive deformationBecause the ring feels the ambient pressure and the partial pressure of gases only at the seal, their gradients will be steep near the seal and shallow in the bulk (opposite to the gradients of the point contactSee: Vacuum_flange#KF.2FQF. High-vacuum systems below 10−9 Torr use copper or nickel O-rings. Also, vacuum systems that have to be immersed in liquid nitrogen use indium O-rings, because rubber becomes hard and brittle at low temperatures. O-ring selection is based on chemical compatibility, application temperature, sealing pressure, lubrication requirements, quality, quantity and cost. There are variations in cross-section design other than circular. These include O-rings with x shaped profiles, commonly called X-rings or Q-rings. When squeezed upon installation, they seal with 4 contact surfaces—2 small contact surfaces on the top and bottom. This contrasts with the standard O-ring's comparatively larger single contact surfaces top and bottom. X-rings are most commonly used in reciprocating applications, where they provide reduced running and breakout friction and reduced risk of spiraling when compared to O-rings. There are also rings with a square profile, commonly called square-cuts, lathe cuts, or Square rings. 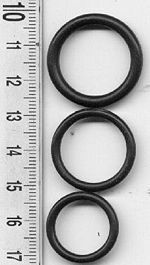 When O-rings were selling at a premium because of the novelty, lack of efficient manufacturing processes and high labor content, Square rings were introduced as an economical substitution for O-rings. The Square ring is typically manufactured by molding an elastomer sleeve which is then lathe-cut. This style of seal is sometimes less expensive to manufacture with certain materials and molding technologies (compression, transfer, injection), especially in low volumes. The physical sealing performance of Square rings in static applications is superior to that of O-rings, however in dynamic applications it is inferior to that of O-rings. Square rings are usually only used in dynamic applications as energizers in cap seal assemblies. Square rings can also be more difficult to install than O-rings. Similar devices with a non-round cross-sections are called seals or packings. See also washer . O-ring materials may be subjected to high or low temperatures, chemical attack, vibration, abrasion, and movement. Materials are selected according to the situation. There are O-ring materials which can tolerate temperatures as low as -200 C or as high as 250+ C. At the low end, nearly all engineering materials become rigid and fail to seal; at the high end, the materials often burn or decompose. Chemical attacks can degrade the material, start brittle cracks or cause it to swell. For example, NBR seals can crack when exposed to ozone gas at very low concentrations, unless protected. Other failures can be caused by using the wrong size of ring for a specific recess, which may cause extrusion of the rubber. The failure of an O-ring seal was determined to be the cause of the Space Shuttle Challenger disaster on January 28, 1986. A contributing factor was cold weather prior to the launch. This was famously demonstrated on television by Caltech physics professor Richard Feynman, when he placed a small O-ring into ice-cold water, and subsequently showed its loss of pliability before an investigative committee. The material of the failed O-ring was FKM which was specified by the shuttle motor contractor, Morton-Thiokol. FKM is not a good material for cold temperature applications. When an O-ring is cooled below its Tg (glass transition temperature), it loses its elasticity and becomes brittle. More importantly, when an O-ring is cooled near, but not beyond, its Tg, the cold O-ring, once compressed, will take longer than normal to return to its original shape. O-rings (and all other seals) work by creating positive pressure against a surface thereby preventing leaks. On the night before the launch, exceedingly low air temperatures were recorded. On account of this, NASA technicians performed an inspection. The ambient temperature was within launch parameters, and the launch sequence was allowed to proceed. However, the temperature of the rubber O-rings remained significantly lower than that of the surrounding air.During his investigation of the launch footage, Dr. Feynman observed a small out-gassing event from the Solid Rocket Booster (SRB) at the joint between two segments in the moments immediately preceding the explosion. This was blamed on a failed O-ring seal. The escaping high temperature gas impinged upon the external tank, and the entire vehicle was destroyed as a result. As for the SRBs themselves, NASA and Morton-Thiokol redesigned them with a new joint design, which now incorporated three O-rings instead of two, with the joints themselves having onboard heaters which can be turned on when temperatures drop below 50 °F (10 °C). No O-ring issues have occurred since Challenger, and they did not play a role in the Space Shuttle Columbia disaster of 2003. An O-ring is one of the most simple, yet highly critical, precision mechanical components ever developed. But, there are new advances that may take some of the burden of critical sealing away from the exclusive domain of O-rings. There are cottage industries of elastomer consultants assisting in designing O-ring-less pressure vessels. Nano-technology-rubber is one such new frontier. Presently, these advancements are increasing the importance of O-rings. Since O-rings encompass the areas of chemistry and material science, any advancement in nano-rubber will affect the O-ring industry. Already, there are elastomers filled with nano-carbon and nano-PTFE and molded into O-rings used in high-performance applications. For example, carbon nanotubes are used in electrostatic dissipative applications and nano-PTFE is used in ultra pure semiconductor applications. The use of nano-PTFE in fluoroelastomers and perfluoroelastomers such as Viton improves abrasion resistance, lowers friction, lowers permeation, and can act as clean filler.